The Tarragona region is a growth area that is water stressed as the Ebro River water is used many times before reaching the sea. The municipalities in the region require more of this river water to enable their growth. Site and regional water supply of the Petrochemical Complex in Tarragona, Spain, is sourced from the Ebro River. AITASA is the company responsible of distributing industrial water in the Tarragona area. 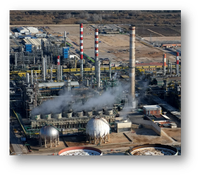 The large Petrochemical Complex in Tarragona has sufficient water rights, which is mostly used in evaporative cooling towers that control the petrochemical process temperatures. The Camp de Tarragona Advanced Water Reclamation Plant (CTAWRP), that VEOLIA and AITASA operates in Vila-Seca (Catalunya, Spain) is fed with the secondary effluent water coming from Wastewater Treatment Plants (WWTP) of the nearby municipalities of Vila-seca, Salou and Tarragona. This plant uses Actiflo clarification technology, two steps filtration followed by two pass DOW FILMTEC™ reverse osmosis that produces relatively high quality, low hardness and low salts water. Within DEMOWARE, Dow Chemical Iberica in the framework of work package 1 and within the Tarragona site had the objective to feed reclaimed urban wastewater from CTAWRP through a dedicated line to their petrochemical production complex (Ethylene Cracker), located in the municipality of La Pobla de Mafumet. There, river water is blended with RO permeate coming from CTAWRP to provide make up water. The Cracker cooling tower ran on 100% Ebro river water at 4 cycles prior to the gradual change to 160 m3/h of reclaimed wastewater. The RO make up goes up in 3 different steps; initial step is between 40-60 m3/h (15%); then moves up to 100 m3/h (25%) to finally reach 160 m3/h (40%). The new water quality allows the cooling tower to be operated at 7 cycles of concentration in summer when ambient temperatures allow high evaporation rates. Stable operation of the cooling tower has been achieved and demonstrated since starting to use to blending of reclaimed water as make-up water in the Dow Tarragona Ethylene Cracker Cooling Tower. The careful management of changing water chemistry in the Dow Tarragona Ethylene Cracker Cooling Tower enabled the use of 160m3/h (nearly 40% of the make-up feed) of RO permeate with minimum impact on corrosion and microbial growth. Depending on the season this frees up more than 200 m3/h of water rights for the municipality. The blowdown was reduced by 76 m3/h the which is a 49% reduction in discharge from the cooling tower. This project has received funding from the European Union’s Seventh Framework Programme for research, technological development and demonstration under grant agreement no 619040.